We all know them, people who say you didn’t really have a good time unless the cops were involved. But what about doctors and nurses? Was it still a good time if you had to go to the ER? Well, Ed Sheeran has given us his view on the subject. The singer’s second album, X, was released just yesterday. In celebration, Sheeran performed for a few hundred lucky fans at an iHeartRadio Album Release Party in Burbank, California, where he shared some personal anecdotes with host Mario Lopez. One of those tidbits involved a trip to a karaoke bar in Nashville where his exuberance led to a short hospital visit with a friend. Sheeran told the crowd how he’d been drinking and singing the night away when he accidentally sliced open one of his hands while “playing drums with beer bottles.” Hmm… I mean, you would, wouldn’t you? Apparently, it was a pretty bad cut as he told the crowd that the white shoes he had been wearing that night turned brown thanks to a rather profuse amount of blood. Thankfully, fellow singer, and apparent knight in shining armor, Gavin DeGraw happened to be there as well. According to Ed, Gavin put Sheeran in the backseat of his car and drove him to a local hospital to get stitches. As if that wasn’t enough, DeGraw then took Sheeran out for a burger and then drove the stitched-up singer home. All of that and the two had just met for the first time that very night! Now that is a friend for life! You can click here to see more of Sheeran’s performance and interview with Mario Lopez. Then be sure to check out Sing-N-Share and KaraokeOnVEVO where you can sing your favorite songs from Ed Sheeran, Gavin DeGraw, and many other of today’s hottest artists. Billie Jean… On Beer Bottles? You’ve never heard MJ like this! Despite his untimely death, Michael Jackson sure has been in the news a lot lately. From the release of his second posthumous album, Xscape, to an amazing, if controversial “live” holographic performance at the 2014 Billboard Music Awards, MJ’s ghost is seemingly everywhere. Now, five guys who call themselves “The Bottle Boys” have channeled his spirit with a collection of… beer bottles? A viral video of the group performing the late superstar’s classic “Billie Jean” on perfectly “tuned” beer bottles has hit YouTube and is quickly becoming a sensation. I think it’s a safe bet to say you’ve never heard Michael Jackson quite like this before. This is far from the Denmark based quintet’s first performance as they have covered everything from Christmas songs to Lady Gaga. They also appeared on Britain’s Got Talent in 2013, thrilling the crowd, but receiving less than a warm welcome from perpetual party-pooper Simon Cowell. OK, so they may never win a Grammy, but that’s not always the goal, is it? These guys are having fun and entertaining people both live and on YouTube. “Billie Jean” is their most recent cover and it has received almost half a million views in eight days. Simon might not be a fan, but then fun is usually best recognized by those who don’t have a stick up their bum. The American dream has changed quite a bit over the last few decades. The house, white picket-fence, a dog, and 2.1 kids is no longer the driving force behind the aspirations of many American citizens. Still, we glom on to any stories in the tabloids or online having to do with our favorite celebrities’ personal lives, especially when it deals with their families. Why? Because family will always be an important aspect of American culture. Country music icon Dolly Parton has opened up about her personal views on family and why she decided not to start one of her own during her legendary five-decade career. Dolly has just released her 42nd studio album, Blue Smoke, available now on Amazon, Google Play, and iTunes. Also, check out Karaoke Cloud and our free Sing-N-Share app, where you can sing several of Mrs. Parton’s most famous tunes. It is said that imitation is the sincerest form of flattery. If that’s the case, and I tend to agree that it is, then the new video for Michael Jackson‘s posthumous collaborative single, “Love Never Felt So Good,” is the most flattering tribute of all time! The awesome video features Justin Timberlake along with several talented dancers performing some of Jackson’s most iconic moves. It also shows multiple clips from previous videos of the king himself pulling off the same moves as only he could. From “Billie Jean” to “Bad,” the moves are all there, and while this is technically a Justin Timberlake video, the focus is on the amazing group of lesser known dancers who fill the screen with their homage to the late King of Pop. Michael’s popularity shows no signs of subsiding as “Love Never Felt So Good” hit the Billboard Top 20 in its first week of release. The parent album, Xscape, was released Wednesday (5/13) and is expected to sell 140,000-150,000 copies by the close of the week, landing it in the #2 spot on the Billboard charts and proving that we will always remember one of the most beloved entertainers of all time. Throughout his 18-year career, Eminem (a.k.a., Marshall Mathers) has never shied away from expressing exactly how he feels in his lyrics. From his personal battles with substance abuse to his disdain for other artists, Slim Shady has held nothing back, including his animosity towards his own mother. In one of the most famous feuds in music history, Eminem regularly embedded hateful messages about his mother, Debbie Mathers, in his songs. Ranging from her alleged drug use to the mistreatment of both him and his younger brother, Eminem put it all out there for the public to hear. Making matters worse, Ms. Mathers sued her son in a high-profile defamation case in 2001, which was eventually settled out of court. This volatile feud may finally be coming to an end, however, as Eminem has dropped a new video apologizing to his mom for the hurtful things he said about her in his previous songs. Entitled “Headlights,” the song was included on his 2013 studio album The Marshall Mather LP 2, but the video for the single hit just in time for Mother’s Day, 2014. 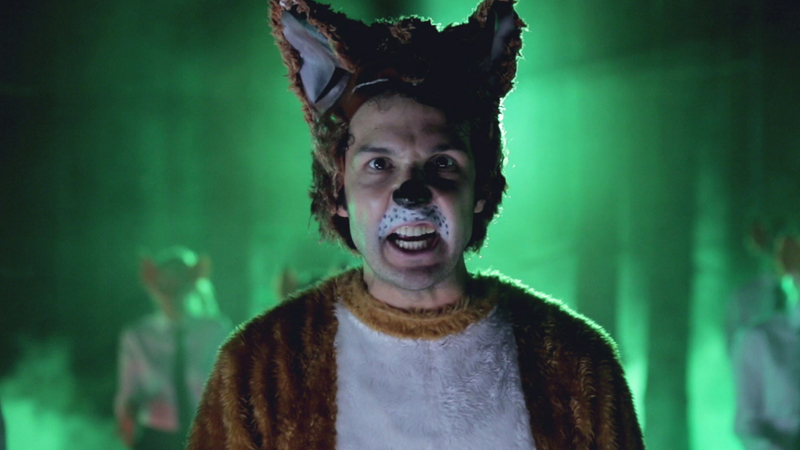 Ylvis Has Left The Forest: “What Does The Fox Say” finds its way to Karaoke Cloud! How do you achieve international stardom in the pop-music industry? Apparently by making fun of the pop-music industry! Just ask Ylvis, the Norwegian comedy duo consisting of brothers Vegard and Bard Ylvisaker. Their “anti-hit” video “The Fox (What Does the Fox Say)” has embedded them firmly into Western pop-culture and now the satirical sensation has made its way to Karaoke Cloud! Originally intended as nothing more than a promotion for their Norway-based comedy show, “I kveld med Ylvis (Tonight with Ylvis), The Fox was written and produced as a sardonic take on the electronic dance music industry. The video was posted to Youtube on September 3, 2013, and has gone uber-viral with over 287 million hits and the song itself claimed the #6 spot on the Billboard Hot 100 for three consecutive weeks. That makes it the highest ranking song by a Norwegian artist since a-Ha smoked the charts at number 1 with “Take On Me” in 1985! Ah…sweet irony. What Does the Fox Say has spawned an amazing amount of covers and parodies and has even been featured on Late Night With Jimmy Fallon and Saturday Night Live.